Billy Joe and Christin Grace accept a check from Geneva Bowlin, co-founder and Board Member of Project 3:27, for $1700. The nonprofit also collected food and household items for the couple. A local nonprofit that usually focuses on providing vehicles to families in desperate need of transportation took on a special project in December. Bowlin said the Grace family — Billy Joe, Christina and their children — had survived natural disasters, health issues and more. Bowlin said that in 2017, the family’s home was destroyed by a tornado causing the them to move, a heavy burden for parents already caring for sick children. So, Bowlin took to social media to seek help for the family. “I sent the message out on Monday and set a deadline for Friday at noon,” Bowlin said. “Project 3:27 collected $1,700 and a pick-up [truck] load of goods” ranging from diapers and laundry supplies to lumber and food. Christina said the family, who has a personal connection with Bowlin, was overwhelmed by the gesture. 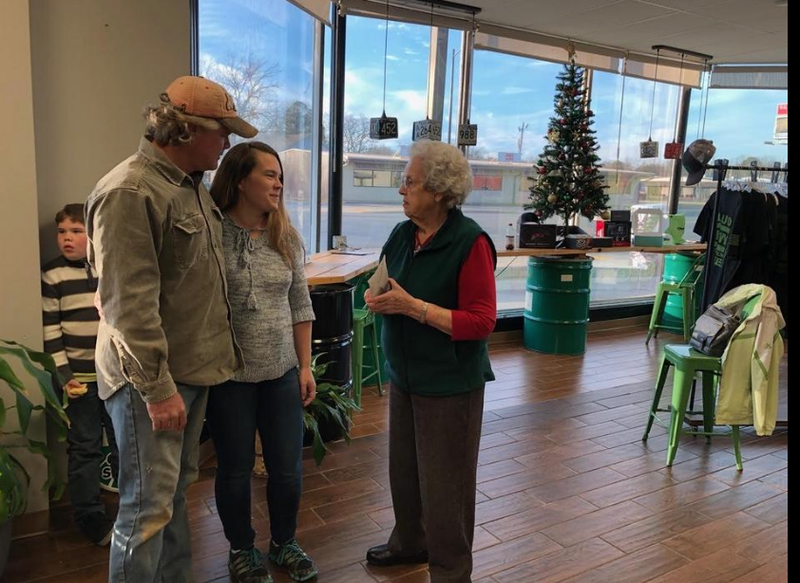 The family met with Bowlin and other members of the nonprofit at Green Toad Auto where Bowlin presented the couple with a check for $1,700. Bowlin said she was happy the nonprofit broke out of its mold for the cause. “Normally, Project 3:27 works with taking in donated cars, repair it then give the vehicle to a family who desperately needs transportation,” she said. For more information about Project 3:27, which is based on Proverbs 3:27, visit http://www.project327.com. Proverbs 3:27 Do not withhold good from those who deserve it when it is in your power to help them. Project 327 is committed to meeting the automotive needs of families and individuals by providing a life changing event through collaborative efforts of companies, as well as individuals, to not withhold good from those in need when it is in our power to help. We depend on the willingness of our friends, business and others to help support us through donations of vehicles, time and money. What happens when a vehicle is donated to Project 327? We have two different business that deal with our donated vehicles. The donated vehicle is checked out by our mechanics and determine what we need to get it ready for service. Vehicles we donated our first year. This young man was a graduate of Renewal Ranch. While there he participated in Bible study and became so interested in the Bible that he decided to go on to Bible college. This was a life changing experience and the vehicle was a means of helping him accomplish this. This is just an example of the 28 vehicles we have donated to deserving families that were in need of a vehicle. 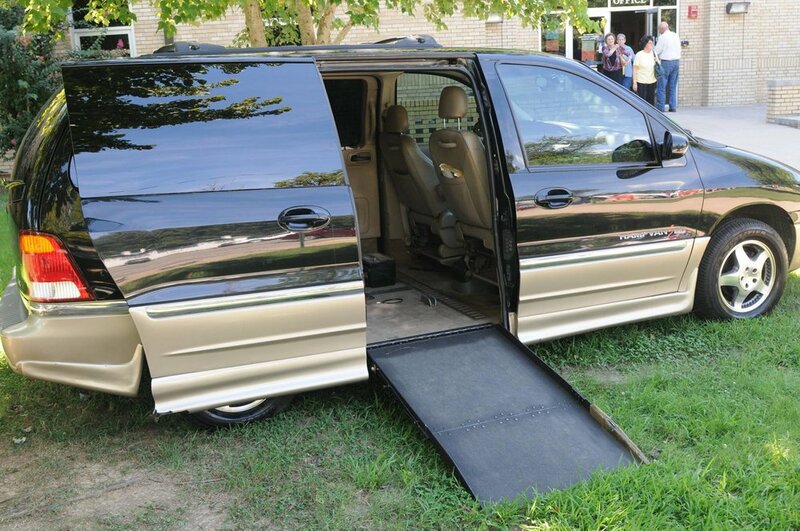 We received this fully outfitted handicapped accessible van from a young woman who no longer needed it for her daughter. Project 3:27 knew of a man who had suffered a brain tumor who was desperately in need of help. His wife was struggling to take him(by car) to his doctors and therapy appointments. She has told us many times that the van was truly a blessing, as she said her back could not have held out much longer. CLICK TOP RIGHT three short white lines.